I think there’s a lot of myths around what women can and can’t do before pregnancy or after pregnancy and I think in a way I had all these sorts of negative ideas in my head, it was quite depressing. I went through a phase where I was really quite down about the whole thing about how my life is never going to be the same again and I’m never going to be able to compete at the same level again and in fact, looking at it now, it seems silly because I’ve competed at a much higher level since Louis was born than I did before. Current ACOG guidelines recommend 30 minutes of daily exercise; while earlier guidelines suggested a maximum heart rate of 140, more recent recommendations rely on a scale of perceived exertion. In other words, not working to exhaustion and keeping effort to around a 7 out of 10. When exercising during pregnancy it is important to keep cool and hydrated. As long as one observes these sorts of guidelines, within a normal pregnancy, it is possible to enjoy many activities. While it is entirely possible, and even important, to exercise during pregnancy, in the early stages of her pregnancy Rosi often encountered light headedness, fast pulse rate and some nausea, ‘so, while it can be safe to do quite a wide range of activities, it may be not the time when you feel at your best’. In Rosi’s experience, ‘I had some problems at that stage with my training because I just didn’t want to do anything’. She did manage some cardio and grappling with ‘trusted’ partners who could be relied upon to ‘do a bit of technical work without things getting crazy’. There’s many women in BJJ and MMA who do have children and I think they’ll tell you the same thing, there’s absolutely no reason why you can’t compete at at least as high a level, if not a higher level, after having children. As her pregnancy progressed and Rosi felt better she wondered ‘what can I do’. Rosi hooked up with a personal trainer with experience of pregnant athletes: ‘He was quite comfortable pushing me quite hard within certain limits’ and from 16 weeks her focus shifted to strength and conditioning work as grappling became more awkward. Rosi worked closely with her PT and by 7-8 months was doing modified Olympic lifts: ‘Felt like doing that gave me quite a lot more energy. While I’d put on quite a bit of weight I still felt light on my feet; I didn’t feel as heavy as I was.’ Rosi stresses the importance of ‘being adaptable’ to the restrictions of pregnancy, and taking the opportunity to explore new forms of activity. 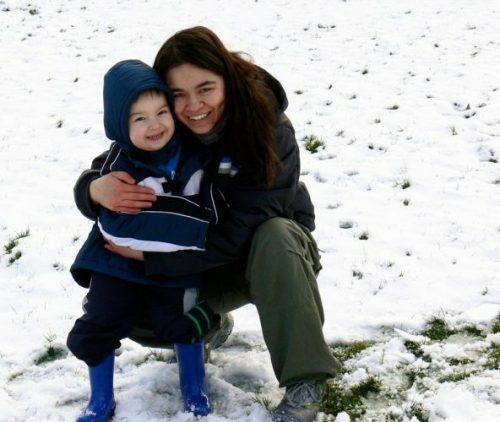 So, while Rosi continued a small amount of grappling with trusted partners throughout her pregnancy, her main focus was weight training which allowed her to keep active up to the birth and get back on the mats after her 6 week check up: ‘[Keeping active] meant that when I got back to training it made it much easier to slot back into things’. Indeed, 7 months after the birth of her son, Louis, Rosi fought and won her MMA match against Dina van den Hooven. When you sit people down and you explain to them I’ve looked into it this, this is what the evidence says, I know what I’m doing, people usually go ‘oh, okay, then’. Its reassuring people that you have looked into it and you’re not being reckless. Training during pregnancy is as much a matter of clarifying what exercises are safe for you to perform as managing the expectations of those around you who may come from the perspective that pregnancy is a time for inactivity: ‘It is important to have good solid facts to show people and to show that you’re taking precautions and being sensible about things’. Through evidence-based research around exercise and pregnancy and consultation with health care professionals it should be possible for the majority of women to enjoy an active lifestyle during pregnancy. The key is to identify where the risks of activity lie and to define a positive path forward to pursue activity, safely. In this way, mother and baby can reap the healthful benefits of exercise during pregnancy, while allowing BJJ mums-to-be the opportunity to stay fit and primed to return to the mats when they’re ready! Online resources that may be of interest. Gracie Mag, Where Was Tracy Goodell in 2011? Mom On The Mat, My Baby Girl is Starting Off Right! Mayo Clinic, Exercise During Pregnancy: Is Heart Rate a Concern? Donovan and Miller, Exercise During Pregnancy: Developmental Origins of Disease Prevention? Lecture by Michelle Mottola (University of Western Ontario), Exercise During Pregnancy: What Are the Guidelines, North London Community Centre (24 Jan 2011). The content of this article is not meant as medical advice or as a replacement for seeking medical advice regarding pregnancy and exercise or pregnancy and BJJ. Pregnant women should consult their physician before embarking on an exercise regime.